Do you have a friend or family member who is having a baby? Are you looking for tips for throwing a baby shower or ideas of how to organize a baby shower? Then I hope you’ve come to the right place. Here you’ll find easy tips for how to decide when to host the shower, who to invite, choosing a theme, invitation ideas, decoration ideas, recipes for food, game ideas and tips for favors. Here is an easy to follow baby shower checklist (free printable) to use during your planning. 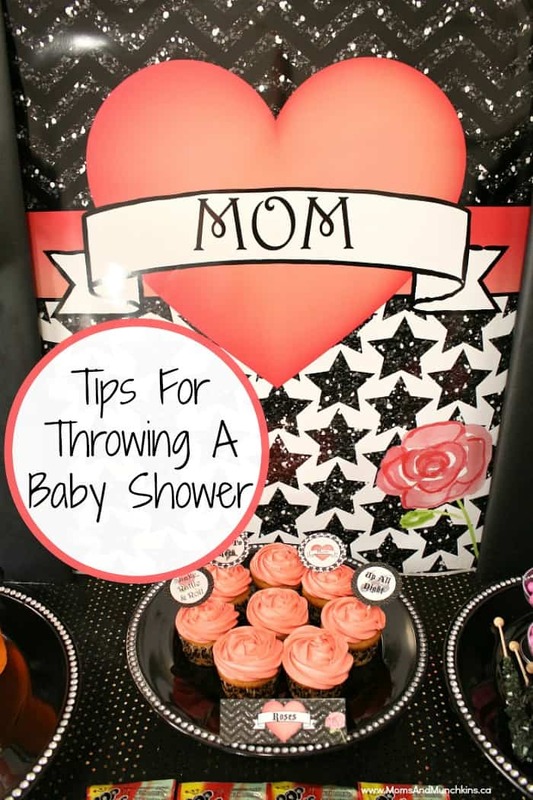 When To Host The Shower: This should really be up to the mommy-to-be. Some mom’s prefer a baby shower before the birth of the baby so they have time to visit with guests. This also gives the mommy-to-be an opportunity to sort through the gifts at home and put everything in order before the baby arrives. Other mom’s prefer to have the baby shower after the baby is born so that the baby can come along to the shower. It’s a great way to have everyone welcome the new addition. Also, if the gender wasn’t known or announced before the birth, people would then know the gender in order to buy gender specific gifts. It’s all up to the mommy-to-be and her preference. Before you get more into the tips for throwing a baby shower, you should know if the shower will be before or after the baby is born. Who To Invite: Again, this should be up to the mommy-to-be. Check with her on her guest list and ask if her mom or mother-in-law also have guests that they’d like to include. One mommy-to-be may prefer to have a small baby shower where another may think that bigger is better. Also, some family members or co-workers may be hosting their own shower for the mommy-to-be so the one you’ll be hosting should be limited to friends. It’s best to check with the mommy-to-be so that you ensure she has the type of party she dreams of with the guests she wants to share the day with. Inviting Out Of Town Guests: Some people aren’t sure whether they should invite some out of town friends or family to the baby shower. If you are inviting some family members who live in the same town as the mommy-to-be, then it wouldn’t hurt to send along an invite to close family members & friends who also live in another city. They may not be able to make the trip for the shower, but at least this way no one feels left out. If there was a large group in another city that aren’t able to make it to the shower and want to be included, suggest that they gather in one location in their own city and call in for a short webcam appearance to the party. Choosing A Theme: Has the mommy-to-be started decorating the baby’s room yet? Does she know the baby’s gender? These are both important points when deciding the theme of the baby shower. If the mommy-to-be has chosen a theme for the nursery, you may want to choose to theme the party around the new baby’s nursery. If the mommy-to-be has announced the gender, you may want to decorate more in pink for a girl or blue for a boy. Is your mommy-to-be a princess type? Then shower her with a princess baby shower theme. Does she have a nickname for the baby? If so, try to theme the party around the baby’s nickname. Is this not your pregnant mommy friend’s first baby? If so, she may already have a lot of the items she needs for the upcoming arrival and may just want to gather with friends and family for a celebration rather than a typical baby shower. If so, check out this page on Throwing A Baby Shower For A Second Child. When trying to decide on a theme, always try to do some brainstorming about what the mommy-to-be likes and what hints she may have already given you about her bundle of joy on the way. Many of these tips for throwing a baby shower will revolve around a theme. Some people frown upon registry information in an invitation but some guests really appreciate the tip because they don’t want to duplicate items that the mommy-to-be already has. You may just want to spread the registry information by word of mouth. There are many invitations that are already created and all you have to do is fill in the required information. If you are a crafty person and want to create your own, visit your local craft store to pick up thick paper in pastel colors and baby-themed embellishments. Food: Tips for throwing a baby shower wouldn’t be complete without ideas for food! Appetizer food is perfect for a baby shower. You can serve a variety of little sandwiches, crackers, cheeses and other finger foods along with some hot appetizer dishes (click here for some of my favorites like Hot Artichoke & Spinach Dip). Dessert: Cupcakes with cute toppers inspired by the baby shower theme are a great option. Here is a link to some of my favorite desserts – lots of options here for cake, truffles and more! Game Ideas: Our tips for throwing a baby shower couldn’t leave out games! There are so many fun ideas for baby shower games that I had to create an article just about games – click here to check it out. I hope these ideas have provided you with some helpful tips for throwing a baby shower. For more baby shower tips, free printables, theme ideas and free printable games, please see our Baby Shower page. Stay updated on all the ideas for family fun, baby showers and other parties by following us on Facebook, Twitter, Pinterest and Instagram. I just love some of the baby invitations they have out now. Nothing that you would ever find in the department store. I just love how you can personalize them..so many different designs.